For the past two years, creative writing students from DePaul have been traveling all over the city to interview Chicagoans about youth violence. This undertaking—part of a unique partnership between DePaul and Steppenwolf Theatre—is finally coming to fruition. How Long Will I Cry? 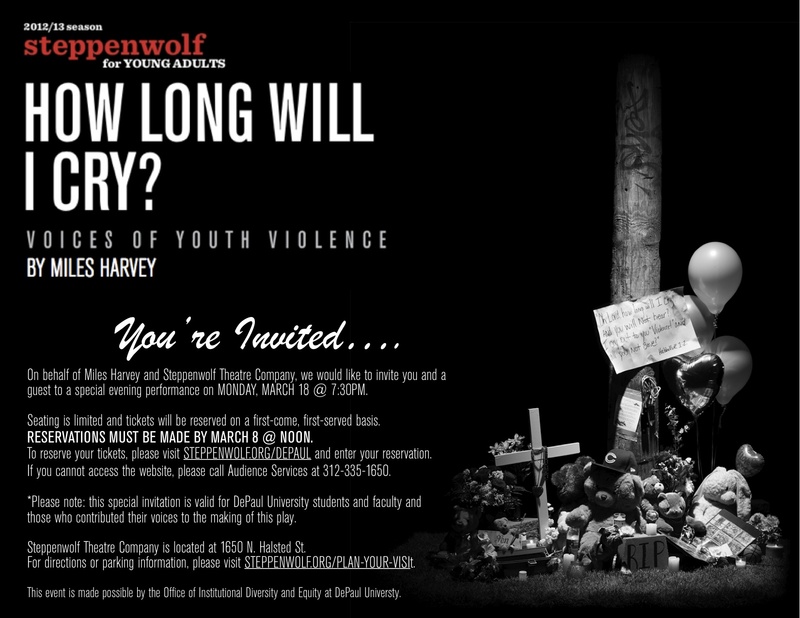 : Voices of Youth Violence premieres at Steppenwolf Theatre this week. The play was recently written up in Time Out Chicago magazine, and you can read the article at timeoutchicago.com/arts-culture/16052251/how-long-will-i-cry-at-steppenwolf. The English Department would like to invite you and a guest to a special performance of the play at 7:30 p.m. on Monday, March 18th at Steppenwolf Theatre, 1650 N. Halsted. This event—sponsored by DePaul’s Office of Institutional Diversity and Equity—will honor those who made the oral-history project happen: our own creative-writing students, as well as the people from all over Chicago who welcomed them into their lives and their hearts. Admission is free for DePaul guests—but seating is extremely limited. Reservations must be made no later than noon on Friday, March 8th. If you are certain that you will attend, follow the attached instructions and reserve your seats right away. Tickets will be handed out on a first-come, first-served basis. Because supply is so limited, out of respect for other guests, please refrain from reserving seats unless you’re absolutely certain you’ll be able to attend. Tickets can be reserved at: steppenwolf.org/Plays-Events/Calendar/RSVP. Many other narratives from this project are being used in the book, also entitled How Long Will I Cry? : Voices of Youth Violence, which will be published by DePaul’s new Outreach Press this spring. Please keep an eye out for more information about that project in the coming weeks. Award-winning poet Debra Bruce will be reading from her latest collection, Survivor’s Picnic, at Northeastern Illinois University on Monday, March 4th, along with several NEIU alumni poets–including current MAWP student David Mathews. David, along with Laura Jean Bailey, Larry Dean, Elisa Karbin, Lani Montreal, Valerie Pell, and Maggie Ward, will be reading with Bruce at 7:15 p.m. in the Golden Eagles Room of the NEIU Student Union, located at 5500 N. St. Louis Ave., Chicago IL 60625. This event is free and open to the public. Crab Orchard Review is now accepting entries to its 2013 Student Writing Awards in Fiction, Nonfiction, and Poetry. One winner will be chosen in each category (fiction, literary nonfiction, and poetry). The three category winners will each receive an award payment of $500 and be published in the 2014 Winter/Spring issue of Crab Orchard Review. Guidelines: The award competition is open to all undergraduate and graduate students who are U.S. citizens or permanent residents currently enrolled (at the time of the submission period) full- or part-time in a U.S. college or university. All entries will be screened by published and accomplished writers and editors. Entries must be previously unpublished, original work written in English. Simultaneous submissions are considered, but an entry is ineligible to win if accepted for publication elsewhere. All entries must be submitted online by March 18th, 2013 (entries will be accepted until 11:59:59 PM (Central Time)). All entrants will be notified of results by email. Page Restrictions: Prose entry length: up to 4000 words for fiction or for literary nonfiction. Poetry entry length: one poem only, up to 3 pages in length. Entrants may only submit one story, one nonfiction piece, or one poem. Do not submit work in more than one genre. Entry Fee: Beginning in 2013, there will be a small processing fee ($3.00) to pay for the cost of the online submission system. All entries must be made online. You can find complete guidelines and submit your work at craborchardreview.submittable.com/submit. This entry was posted in Events, Student News, Writing Contests and tagged crab orchard review, david mathews, debra bruce, depaul, fiction, how long will i cry, nonfiction, northeastern illinois university, poetry, steppenwolf, theater, writing contest.